You don’t need a mental health professional to tell you that a serious illness or loss of a pet can be as psychologically devastating as that of a person. Many people go through the same range of emotions and grief process as that experienced after the death of a person. It has been suggested that the death of a pet is a loss of a source of non-judgmental love. Pets don’t judge us and give us affection unconditionally. Pets allow us to satisfy our need to nurture and care for others. 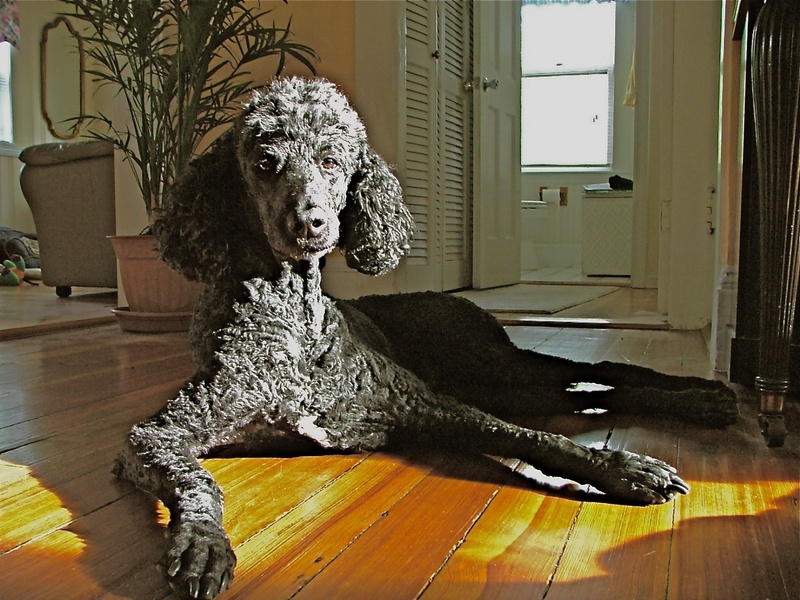 Totally out of the blue, my 9-year old poodle Chequers, started having some serious health problems recently. He underwent a series of tests and then was diagnosed with Lymphoma after ruling out just about everything else. He was near death with little bodily functions when he was prescribed Prednisone, and within a few days he stabilized. Our local vet did not sugarcoat the news and to guard against our enthusiasm and sense of hope- he and the hospital Vet both labeled his prognosis “guarded at best” and we were told that he had only a few months to live, at most. We wanted answers to all our questions, but were left feeling there was no hope or options, and the tests were often inconclusive. After depleting us of our hope (and our bank balance), they still didn’t know what was going on with Chequers- leaving us frustrated and angry. Needless to say, this has been an extremely stressful time for me and my family emotionally and financially and brought up memories of past losses of pets and relatives alike. I re-experienced the feeling associated with the loss of my first pet and recalled the grieving process that I went through. When sharing our story with friends and relative many described similar experiences with their pets and the “rollercoaster ride” of emotions that they experienced. After conducting some research into what I was going through- I discovered that over half of American households have pets. Because these pets are companions and share our lives on a daily basis-most of us consider them part of the family. Knowing that others had similar experiences and sharing them was helpful to me but I learned that unfortunately, society as a whole does not give as much support for pet loss as that of a person. There are no days off work allowed in any company I have ever worked for-to cope with the loss of a pet, and many people ask you “when you are going to get another pet?” There is somehow the belief that pets, like objects, can be replaced easily and the implication is that grieving is not necessary. As many people do-we tended to blame ourselves and each other for our pet’s illness. Did we give him the wrong (tainted) brand of dog food? Did we allow him to play on too many lawns with chemicals? Did we not take him to the vet often enough? We could not help but wonder if we made “the right” decisions at key points in the crisis. We were also distressed and angry by the varying levels of competency and caring of the professionals involved that we experienced-especially after we spent so much money and still did not have a definitive answer as to the cause of Chequer’s illness. At the animal hospital we ran into a number of people who shared our concerns, sense of guilt, anger and disappointment with the staff involved. Many we met or observed were in shock, angry, or grieving. Grief is the normal response to any important loss in our life. It occurs regardless of the circumstances surrounding the death-whether it followed a prolonged illness, or suddenly. People that grieve experience both emotional and physical trauma as they attempt to adapt to the upheaval in their lives caused by their loss. Denial may begin when you first learn the seriousness of your animal’s illness or injuries. Often, the more sudden the death, the more difficult the loss is to accept and the stronger the denial. In this stage-the reality of death has not yet been accepted by the bereaved. He or she is still in shock-not having fully comprehended the loss, feels stunned and bewildered. 2.ANGER AND GUILT: Anger and guilt often follow denial. The grief stricken person may have angry outbursts at family, friends, health professionals. themselves, God, or the world in general. The bereaved will also experience feelings of guilt or fear in this stage. The guilt may stem from a feeling of at some level believing that they caused the pet’s illness through some action or inaction. The thoughts will start in this way: “if only I…..” Also, guilt may often be present particularly in the case where the owner had to make the decision to euthanize the pet. 4. DEPRESSION- Depression occurs in reaction to the changed way of life created by the loss. Day-to-day tasks can seem impossible to perform and you may feel isolated and alone. Many depressed people will avoid the company of friends and family. The bereaved person will feel intense feeling of sadness, hopelessness, exhausted, and often helpless. The pet is deeply missed and thought about constantly. 5. ACCEPTANCE- Acceptance can be seen when the changes brought about by the loss are stabilized into a new lifestyle. The level of intensity in the mourning process depends on a number of factor such as the circumstances surrounding the death, the age of the pet and pet owner, the relationship of the pet to the owner and to other family members. Recently experiencing the death of a significant person in the owner’s life can also affect how the pet’s death is handled. Usually, children recover more quickly, while the elderly take the longest. Sometimes, the death of a pet will finally enable the bereaved to mourn the loss of a person, whose death had not yet been accepted. 1. Encourage the child to talk freely about the pet giving them permission to work through their grief. Encourage them to express their grief by drawing pictures of their pet, and sharing what the pictures mean to them. 2. Inform other caregivers. This includes teachers and day care providers. They are in an excellent position to observe and understand any significant changes in your child. 3. Try to openly and honestly discuss death, and grief. Explain the permanency of death. 4. Spend more time with the child and give them plenty of hugs and reassurance. 5. Never say things like “God took your pet,” or the pet was “put to sleep,” because the child will then learn to fear that God, or their parents will take them, and may become afraid of going to sleep. 6. Include the child in everything that is going on. 7. Involve the child in memorializing the pet by making a scrapbook or log with photos, as well as drawn pictures of the pet and family members. Write memories beneath or next to the picture. 1. Give yourself permission to grieve. Only you know what your pet meant to you. 2. Memorialize your pet. It makes the loss real and helps with closure. It also allows the bereaved to express their feelings, pay tribute and reflect, and serves to bring in social support. 3. Seek professional help when your emotions become so severe or prolonged that they interfere with your ability to manage daily activities. Many people experience grief for weeks and months. Grief and depression are just as real over the loss of a pet as they are over the loss of a person. If needed, you can even find a pet loss support group in your area. At a group like this you will be with other people in the same situation as you who understand your grief and can share experiences. 4. Get lots of rest, eat well, and exercise regularly. 5. Surround yourself with people who understand your loss. Let others care for you. 6. Learn all you can about the grief process as it helps pet owners to realize that what they are experiencing is a normal response. 7. Accept the feelings that come with grief, and talk, write, draw or sing. 8. Be patient with yourself. Don’t let society dictate how long mourning should last. One study of grieving pet owners found that one third of them experienced grief and sadness for atleast six months. 9. Give yourself permission to backslide. Grief is like waves in the ocean: at first the waves come in fast and hard, but as time goes on, the waves become less intense and further apart. Don’t be surprised if holidays, smells, sounds, or words trigger a relapse. 10. Ask for help in coping from a higher power if it helps. Oftentimes well-meaning family and friends may not realize how important your pet was to you, or be able to comprehend the intensity of your grief. They may try to be supportive but end up seeming cruel and uncaring. Be honest with yourself and others about how you feel. If despair mounts, talk to someone who will listen to your feelings about the loss of your animal. Talk about your sorrow, but also about the fun times you and the animal spent together, the activities you enjoyed, and the memories that are meaningful to you. Grief is probably the most confusing, frustrating and powerful emotion that a person can experience. It is even more so for pet owners. Society in general does not give bereaved pet owners “permission” to grieve openly. Consequently, pet owners often feel isolated and alone. Luckily, more and more resources are becoming available to help the bereaved pet owner realize that they are not alone and that what they are feeling is entirely normal. I hope this information and resources are helpful to you in your quest for healing after an illness or loss of a pet. Chequers condition declined rapidly about 7 months after he was hospitalized and we were forced to euthanize him. Although, it still hurts when we think of him we try to think of the fun times we had together which helps us to cope with the pain of the loss. 4. Lagoni, L Grieving the death of a pet.